Due to the extreme weather, the “Economic Forecast 2019” scheduled for Thursday morning has been rescheduled to Friday, March 1st, 2019 at the Bremer Conference Center at Danville Area Community College. All tickets previously sold will be honored on March 1st. Advanced tickets will remain on sale for the event at Neuhoff Media. 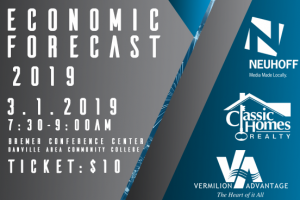 “Economic Forecast 2019,” presented by Classic Homes Realty, will feature a series of panel discussions on Manufacturing, Health Care and Education along with an overview of the Vermilion County business environment. Doors will open at 7am and presentations will be 7:30am to 9am. Neuhoff Media along with Danville Area Community College are hosting the event in support of the Vermilion Advantage. You can visit VermilionCountyFirst.com for more information. Neuhoff Media Danville owns and operates local radio stations WDAN-AM, WDNL-FM and WRHK-FM along with VermilionCountyFirst.com.